Female Wave of Change is very excited to welcome Nawal tares in her Cicle of Wise Women. Her wisdom, expertise and international background is of great value to the women in the world. Nawal will especially work on new empowerment programs together with other wise women and men. Nawal Tarazi, Jordanian living in Geneva- Switzerland since 2010, married with three children; Lian 22 studying Medicine, Dalia 19 studying Environment Studies and Hanna 14 years who is looking forward to studying Engineering. Nawal speaks three languages Arabic, English and French, loves travelling and getting exposed to different cultures. Nawal started her career in banking in Jordan covering several markets. Ten years ago, and after her move to Geneva, Nawal decided to change her career path and started teaching and providing training courses. Currently Nawal is the Head of Business & Media Department at the International University in Geneva (IUG), Switzerland. Nawal holds a Masters’ degree in Money & Banking (MMB) and currently a candidate of Doctorate degree PhD at Plymouth University- UK. 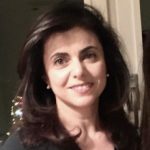 With over fifteen years’ experience handling senior executive positions at local & international financial institutions, seven years teaching and training experience in Swiss universities; Nawal decided to establish her own consulting company and is currently the Founder and Director of NWNT Consulting Sàrl, in Geneva. As professor at the University Nawal is delivering several courses including Risk Management, International Banking & Finance, International Portfolio Analysis, Corporate Finance, Macroeconomics, Microeconomics, Quantitative Methods and other courses. I get to know Female Wave of Change through our dear Global Ambassador Bisila Bokoko who talked with passion and introduced me to this amazing group of ladies. I am privileged to be part of this inspiring group.